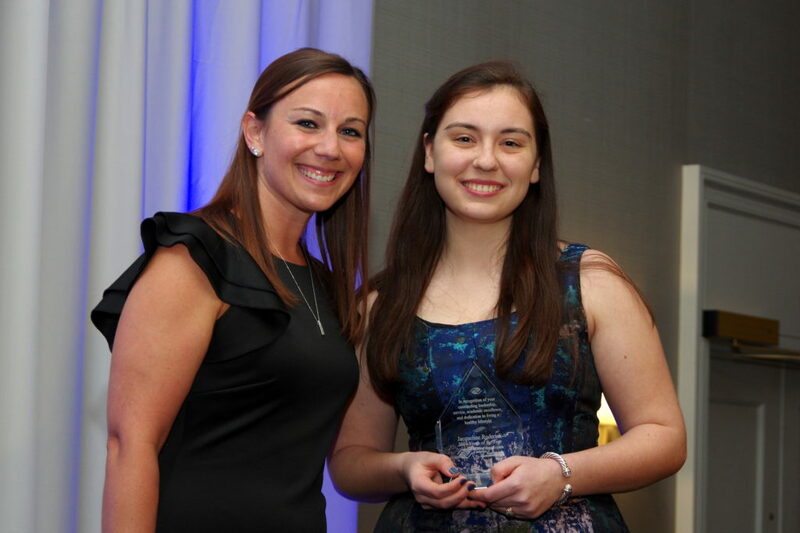 Johanna Cullen, Director of Program and Camp Operations at Boys & Girls Club of Marshfield with Jacquie Roderick, 2019 Youth of the Year. The Boys & Girls Club of Marshfield’s annual Great Futures Gala held at Boston Marriott Quincy was a tremendous success! More than 300 were in attendance at the Club’s signature fundraising event which raised $157,060 and celebrated the Boys & Girls Club of Marshfield’s successes as well as the amazing people who make the Club special. Each year, the Boys & Girls Club of Marshfield, selects one exceptional Club member as “Youth of the Year” to serve as an ambassador for the Club’s youth as well as a voice for all young people. Jacquie Roderick, a senior at Marshfield High School, was named the 2019 Youth of the Year. Ms. Roderick has been involved in the Boys & Girls Club of Marshfield for seven years, first as a member and then as a staff member. At Marshfield High, she is an active member of student government in the role of Vice President, a member of the Drama Club, founder of MIRROR magazine and is the chief of staff for Youth and Government. As Youth of the Year, Ms. Roderick wants to be the role model for younger kids at the Club and help create a welcoming environment for all kids. She intends to study Political Science and Journalism next year at either Boston University or Wellesley College. Ms. Roderick, along with fellow Youth of the Year finalists Kathryn Maull, Mckenna Hanlon, Ryan Curley and Jack Marcella (who are all Marshfield residents) were recognized at the Gala. For nearly 70 years, the Youth of the Year program of the Boys & Girls Club of America has honored and celebrated the nation’s most inspiring teens and their incredible journeys. Stories of outstanding leadership, service, academic excellence and dedication to living a healthy lifestyle have made Youth of the Year America’s premier leadership and recognition program for teens. Over the decades, these individuals have exemplified the Boys & Girls Club mission and are proof of the impact Clubs make in transforming kids’ lives. The Youth of the Year finalists meet and attend conferences both locally and nationally to finalize the one National Youth of the Year winner. Youth of the Year are the Club’s best and brightest, many times having achieved success in a variety of industries, including entertainment, politics, business and sports. The Boys & Girls Club of Marshfield also paid tribute to Honorees of the Year, Thomas and Jayne Cattaneo for their ongoing efforts and commitment to the Club and the community. Tom Cattaneo is Ninety Nine Restaurant & Pub’s Director of Operations from Hingham to Cape Cod, and for the past four years has served on the Board of Directors for the Boys & Girls Club of Marshfield. Tom’s wife Jayne is a Master Pilates instructor and Personal Trainer on the South Shore. “It was our great pleasure to honor Jacquie, who is a tremendous inspiration and role model, and Tom and Jayne for their ongoing efforts and dedication to our Club and the community,” said Jim Bunnell, Executive Director. The Boys & Girls Club of Marshfield would like to thank the Great Futures Gala sponsors: Roche Bros., Brait Builders Corporation, Rockland Trust, Coastal Heritage Bank, Eastern Bank, A.W. Perry Inc., Tim Tedeschi, McSweeney & Ricci Insurance, Scituate Concrete Products, Vertex Engineering, Rand Handy Oil, Brabo Benefits, Colonial Beverage, Brook’s World Travel Fund, St. Ann by the Sea Catholic Church, Merrill Contracting and Survey Service, and Jack Conway Real Estate. The Boys & Girls Club of Marshfield has 550 member families and serves more than 5,000 youth annually from all across the South Shore in afterschool, school vacation and summer camp programs. The Boys & Girls Club of Marshfield (the Club) is a youth development organization providing programs and services to children and families throughout the greater South Shore community. The Club’s mission is to enable and inspire all young people to realize their full potential as productive, caring, responsible citizens as well as become tomorrow’s capable leaders. The Club provides programming opportunities in the Boys & Girls Club of America’s (BGCA) five core areas including leadership, education, health, arts, and fitness. Currently, the Club serves hundreds of families with children ranging in age from 6 to 18 years old, providing afterschool, vacation week and summer programs, as well as youth athletics, teen, social recreational and leadership opportunities. For more information, visit their website www.marshfieldbgc.com or call 781-834-2582.